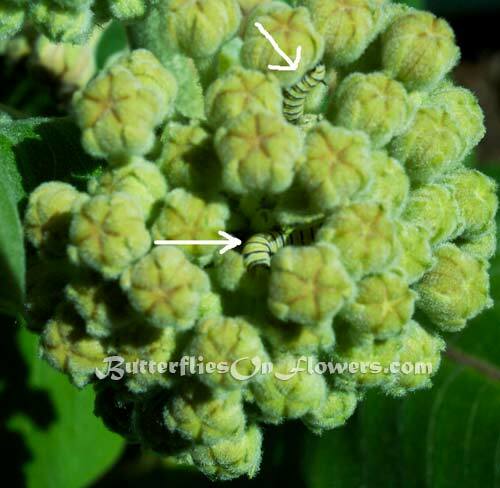 Caption: Monarch caterpillars evade the cold and predators by hiding inside Milkweed (Asclepias syriaca) flower buds. Usually, the baby caterpillars are snuggled so deeply inside the milkweed buds that you can't make out even one stripe. But I managed to find two that gambled on half-camouflaged being good enough. It took me years to realize that they did this, and I always assumed that ravenous predators had gotten to them. While many caterpillars are consumed by predators, some manage to elude them by diving into the unflowered buds. Once the flowers appear, the safe haven disappears. Facts about Caterpillars: Less than 10% of Monarchs survive to adulthood. Ironically, many of the caterpillars that fall victim to predators are the larger ones. The milkweed buds provide a safe shelter for the babies and make it difficult for predators to detect them. Once the cats outgrow the tight bud spaces or the flowers bloom, they're defenseless to a variety of assailants including spiders and wasps.